Styled with luc sweater and trevor pant . 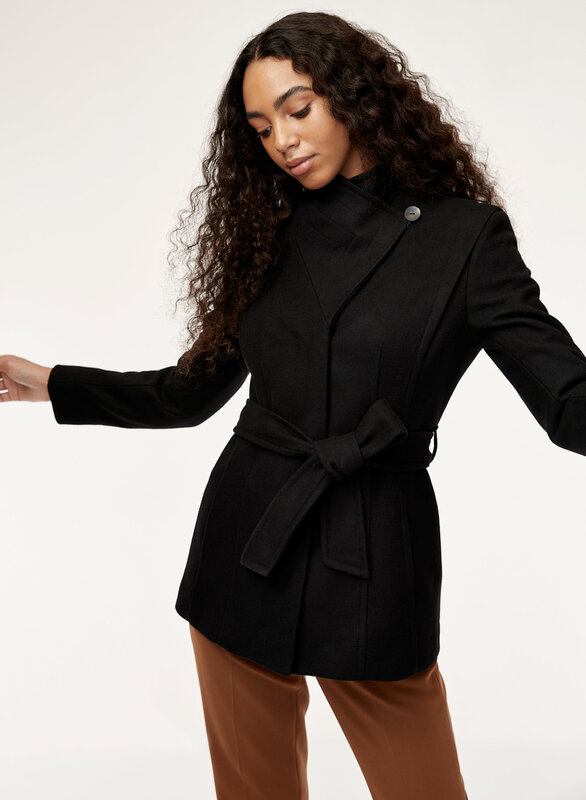 This wrap coat is tailored using an Italian-milled, wool-cashmere blend prized for its exceptional warmth and softness. The fabric is naturally resistant to wind and water, and this updated version has a softer, warmer lining to keep you even cozier. A little wide in the shoulders when ordering large but space to fit a sweater under. Love this coat! Super chic and comfy! Can’t wait to bring it with me on vacation! An essential in your wardrobe. I'm usually an XS in Aritzia, but based on the reviews, I bought an XXS. The shoulders fit well but the waist is small. It still fits well, but take the narrow waist into consideration if you're planning on going off from your usual size. The coat's material is so gorgeous. The blend of wool and cashmere looks and feels so luxurious, and I haven't experienced any pilling like I usually do with coats of cheaper materials. The coat is fully lined, which is a requirement in coats for me, and has side pockets. The pockets are very small. My iPhone 7 does not fit into it, so I would be careful with what you choose to put in the pockets. I love this jacket it’s very slimming , warm , dressy and casual. I really like the style of the coat however when it came in the mail the pocket had a big hole in it. That was quite disappointing but I took it to the store and they said they would fix it so that was quite nice. 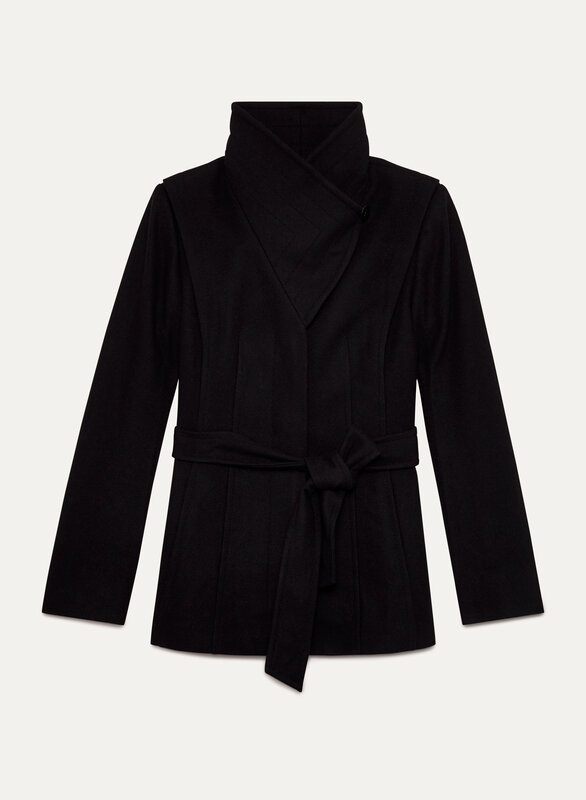 I have been wanting a Babaton coat forever and finally decided to purchase one. I sized up as I usually find all winter coats too short in the sleeves. Although I am a size S, the M doesn't look or feel too large on me. It is the style of coat that 'goes with' everything, from jeans to a dressy outfit. I really love this purchase - the belt tie, the two options/styles of neckline, and the quality! I like the fit of the coat, i have the same one in tan as well but the buttons on the black on tend to pop open. Both coats are the same size so not sure why that's happening. Its so classy and keeps me warm! So glad I bought it! Love the quality of this coat. It does fit small around the chest though the small was fine for me. I just love this coat so much that I wanna wear it everyday except rainy days. Took me a while to learn how to tie it up nicely but it’s just beautiful. Awesome coat,very comfortable. The best coat I’ve ever had. Its Fits perfect on My body, even tho i am wearing 2 layers of sweaters the coat still gives a Shape on my bod. Light and warm.Cozy and business casual. I am glad I made the choice. Really well fitting coat and the tie belt makes it look super flattering. Perfect to wear to work or out to dinner.